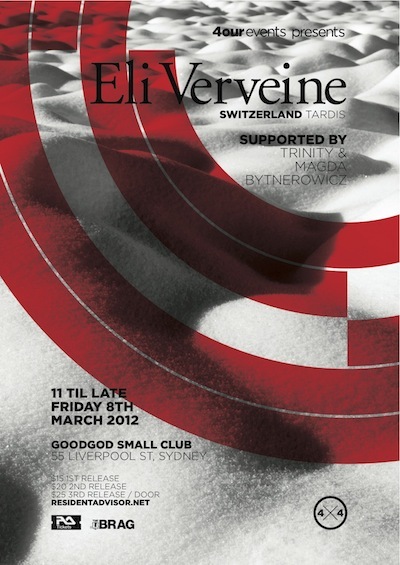 4our’s first international guest for 2013 is the esteemed Eli Verveine. The Red Bull Music Academy graduate hails from Switzerland and has a slew of European club dates under her belt over the past half decade, including recently debuting at Panoramabar. 2012 saw the launch of her record label Tardis (with Oscar Schubaq) the first release of which featured exclusively collaborations between the two. Eli was also asked to contribute a podcast to RA’s series in 2012. She has honed her craft as a resident at Zurich’s legendary Dachkantine club and through her monthly segment on Radio Lora. The result is evident in her insightful and instinctive sets.